Notice the trees with leaves through the window. These trees are shown farther below in the photo showing the back wall of this foundry. 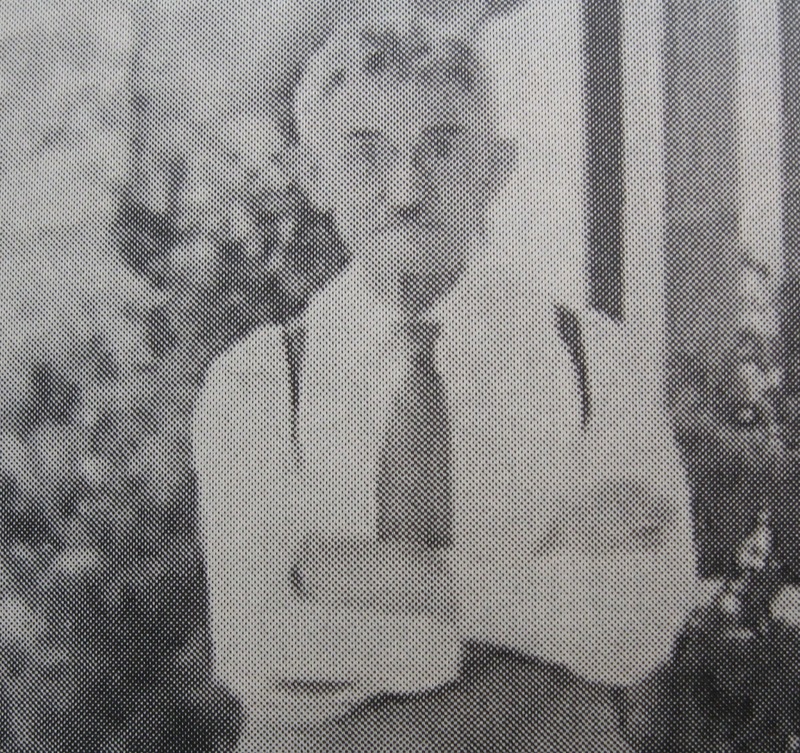 This photo is dated April 22, 1904. Robert Wilmont Harrison is the one with no hat on the left. I truly believe that the 1904 Flint flood was the main reason that the Buick company got into financial trouble and that this was the catalyst that would bring William Durant into the fold and that led to the creation of General Motors. If you think about it the Buick vs. Reid lawsuit has David Buick stating ‘fact’ that the flood was what kept the engines from being produced on time. David Buick told the Wolverine Citizen that they were planning on building 300 automobiles in 1904 and we now know that only thirty seven were produced. Every factory along the river that produced parts for Buick had flood damage and had to be cleaned and repaired. The only main component factory that was not effected was Weston-Mott which built the front and rear axle, and that is because they were still located in New York. The Armstrong spring plant near Oak Park was flooded. The Imperial Wheel plant was flooded. 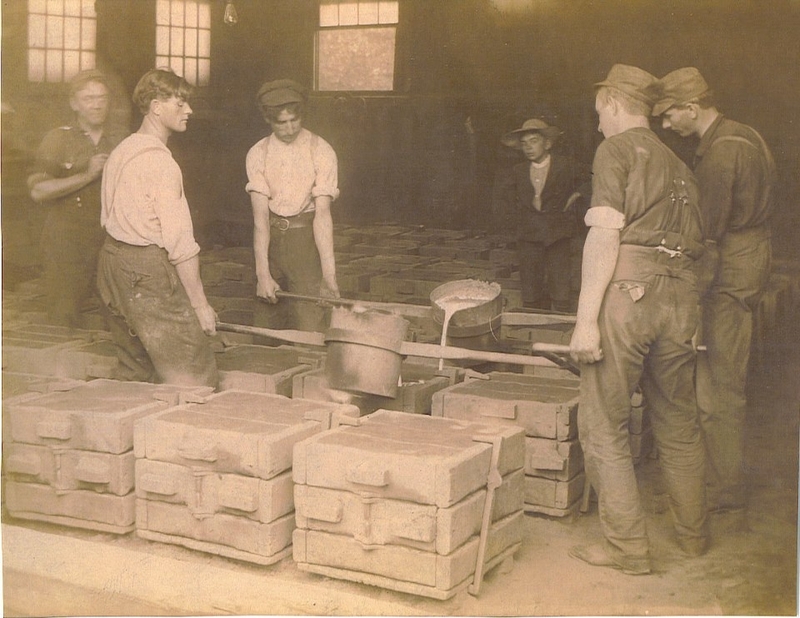 The foundry that supplied brass parts was flooded. Barker &amp; Hamel, who cast the main engine parts was flooded. W.F. Stewart who made the body’s, also flooded. If this act of mother nature had not occurred we may not have General Motors today. We may not have had them making parts for WWI or WWII. 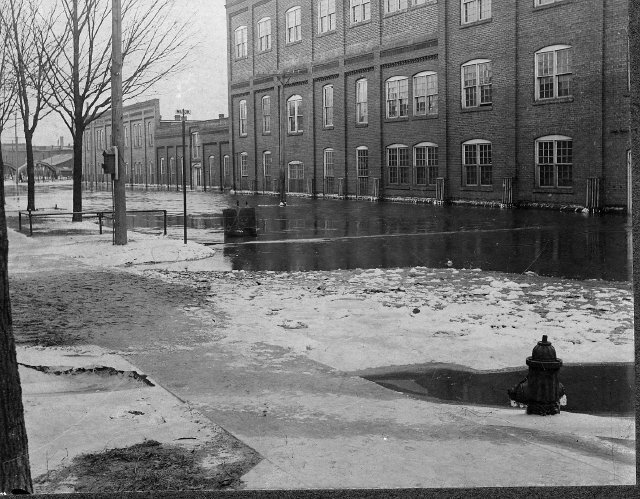 The world could be a much different place today if not for one simple flood in the year 1904 in Michigan. 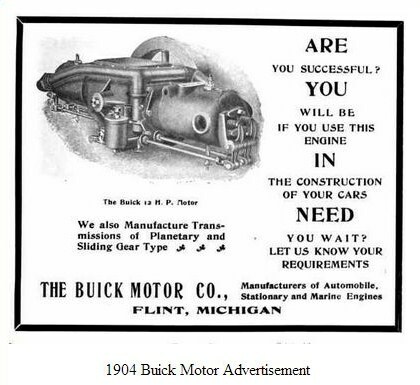 Click here for an alternate history from 1925 that shows December 1903 as the first Buick built. Buick engines through history. Buick milestone dates from 1928. Buick 20th anniversary dates. More Buick history. The early years. 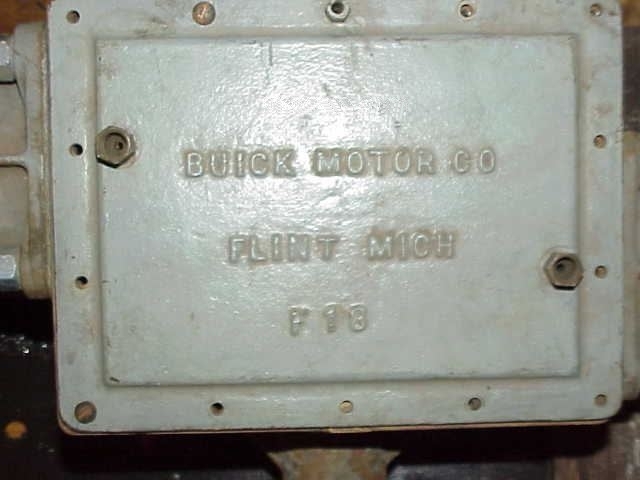 An upper case for an early Buick engine for a Buick automobile in Flint. This is not a 1904 case. The original 1904 top case did not have the oil lines routed through the top. It also did not have the F 18 cast into them. Manuals and literature. 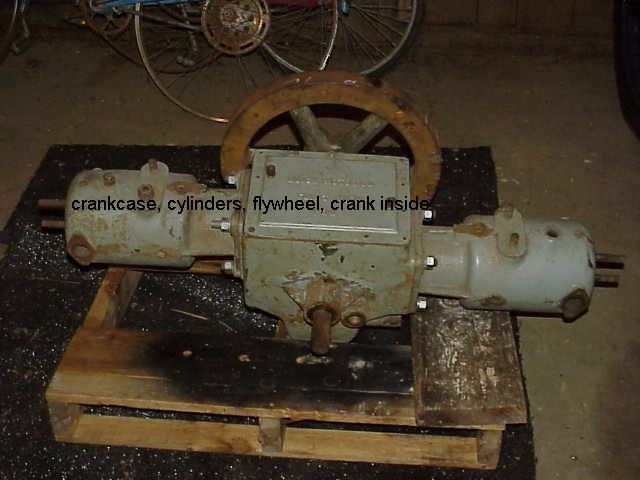 The lower case (crank box) of the first Buick automobile engine for a Buick in Flint. This photo shows the back wall of the Barker &amp; Hamel foundry at the left. The trees are visible through the window in the photo above. The water is quite high in this photo but not yet at a dangerous flood stage. 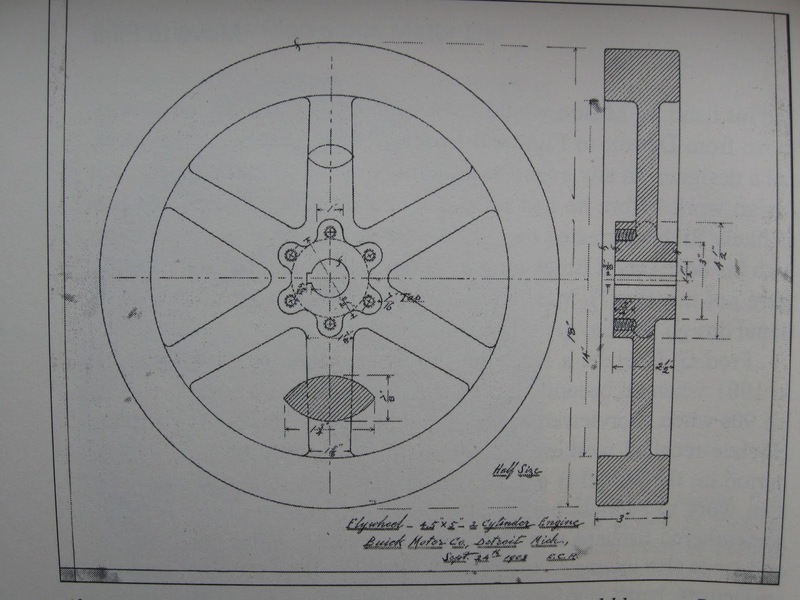 Here is the flywheel blueprint done by Eugene C. Richard on September 24,1903. This is not the flywheel for the L-head engine for the Wolverine automobile. It does look like one stationary Buick engine I have seen. 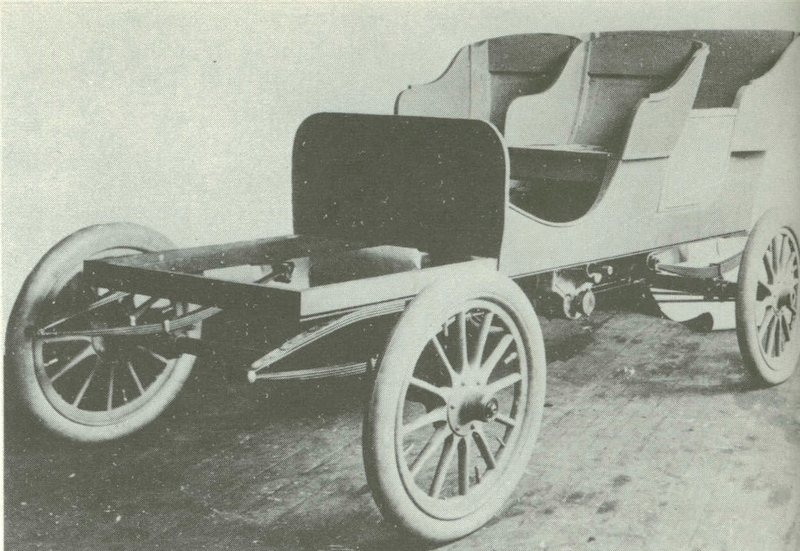 I have found two sources that claim the first Buick car was assembled in December 1903. One also stated that it took until June when “The bugs on this experimental car were killed”. Take it for what you will but every time I close one door another opens on this elusive search. This document has an interesting story which you can read about in the book David Buick’s Marvelous Motor Car by Gustin and Kirbitz and is available at Amazon. 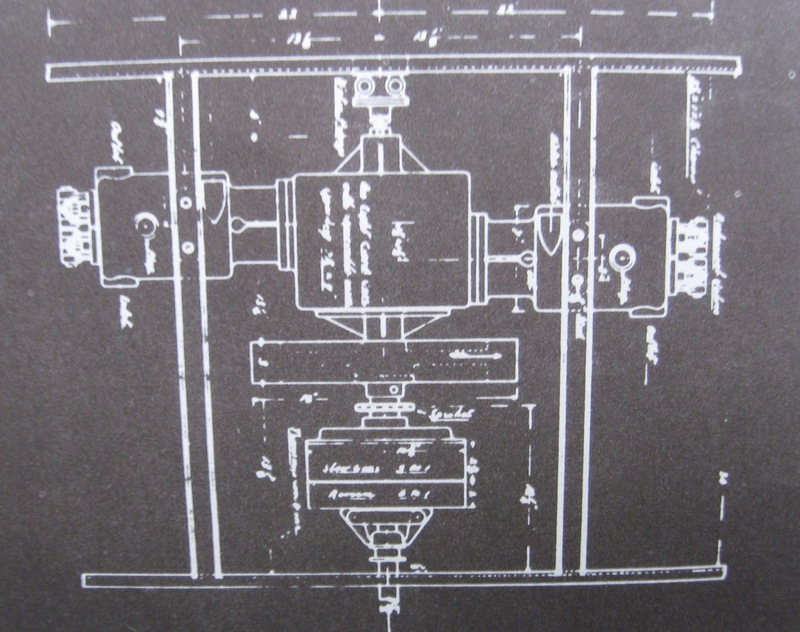 For business reasons Durant did not want this first proper Buick engine patented. Walter Marr with the Chainless Wolverine prototype shortly before he returned to Buick in January of 1904. This is from the Buick book Buick’s First Half-Century. This is the automobile mentioned in the post previous to this that I said was called the first Buick prototype for many years until someone noticed the differential was for a drive shaft . After that it was obvious that it was the Wolverine by the Reid company As I mentioned a few years back, Buick and Marr would have both probably had knowledge of this prototype and their Buick model B could very well have been modeled after this. Just like I mention farther below ‘many ideas were probably borrowed between the two company’s. All through history this has been done with most any product on the market. ‘It’s not an accident’. A 1904 Buick being built. 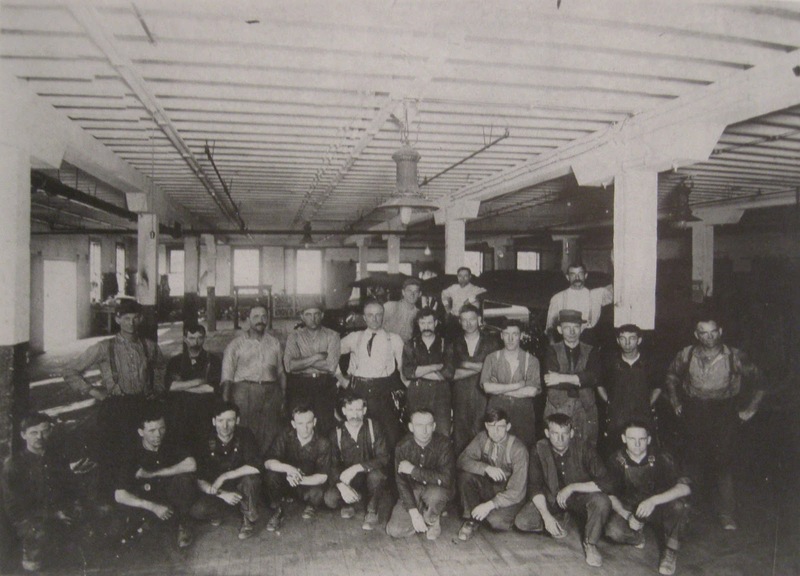 A view inside the Flint Wagon Works in 1913. The recreation of the first Buick. Built as a project of the 1976 United States bicentennial. 1904 manual. History. Specifications 1904 Buick. Oldest surviving Buick’s. Original Aldrich Buick. 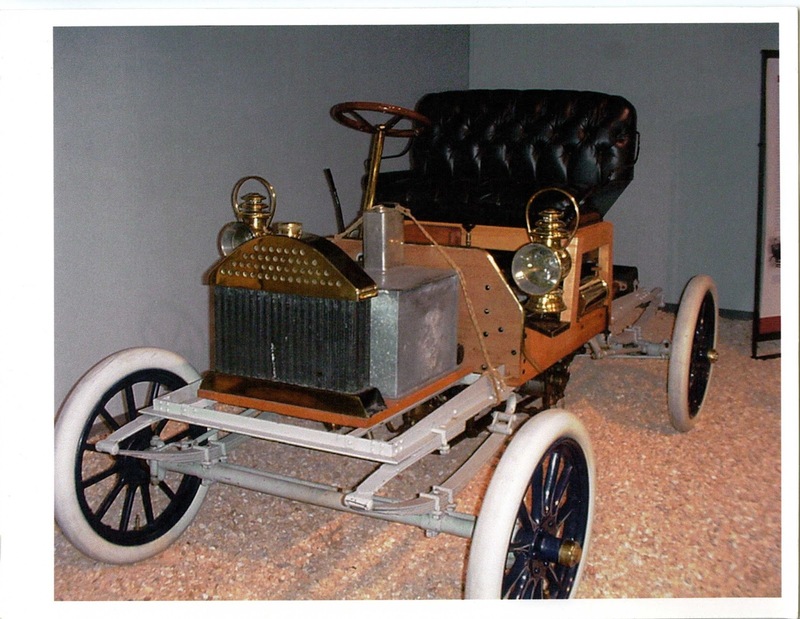 1904 Buick prototype. 1905 model C restoration. More 1904 history. The Sloan Bicentennial project Buick. This is Eugene C. Richard the first person with the foresight to patent the valve in head engine which he said he had taken the idea from his native country of France. 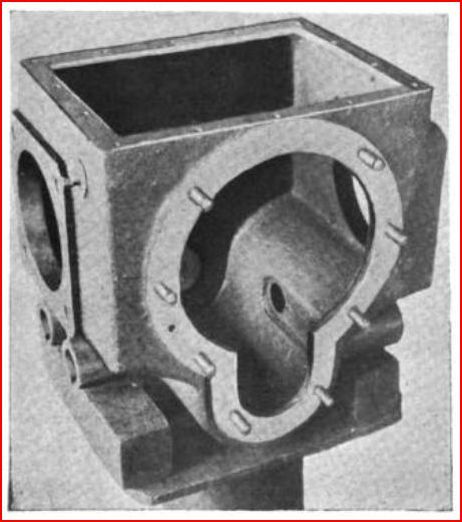 This valve arrangement was being used in steam engines at that time. Here is the Richard patent application after it had been accepted. This would be for the engine below and of special note is the detachable head just like the later Reid engine. This really makes me wonder. 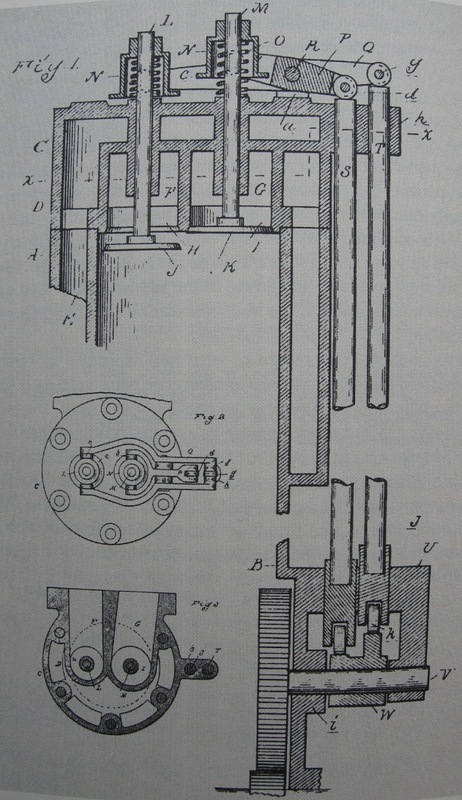 Here is the patented Eugene C. Richard engine (the patent had been filed but not approved at this time) that had the valve in head design on this one cylinder stationary engine. 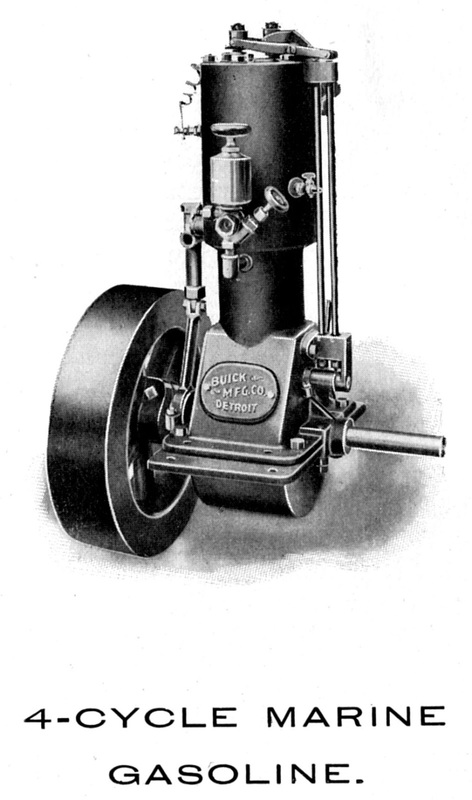 Model B stationary engine. 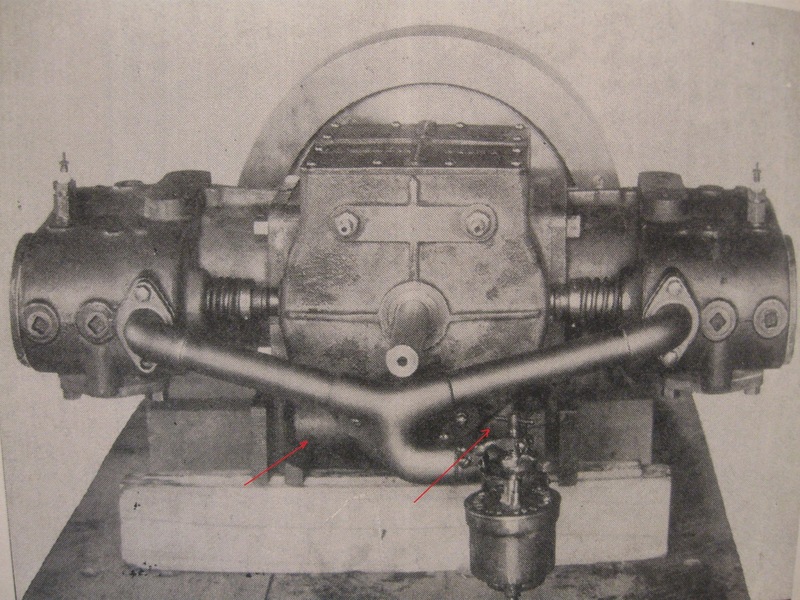 As you see, the main difference with the ‘Reid built’ over head valve engine is that it had detachable heads, which the Buick 2 cylinder over head engine of 1904 did not have. But engineer Eugene C. Richard who was working closer with Buick than Walter L. Marr when they first arrived in Flint makes me think that some kind of crossover of information had been taking place. You must know that Walter Marr was working for Reid up until January of 1904. Buick overhead valve head. End view of the Reid built engine showing great detail of their valve in head arrangement. 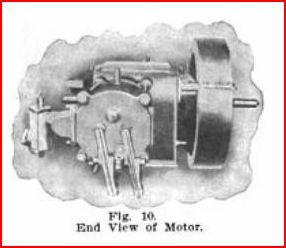 This is the engine that Reid had designed and placed in the Chainless Wolverine after the Buick Co. was late in delivering there L-head engines, which led to the 1907 lawsuit mentioned in the following post. 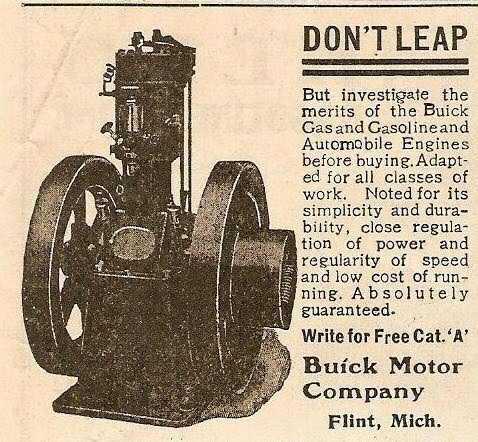 I find it very interesting that this engine is so similar to the engine that Buick would use in it’s first Flint built Buick. The only difference I see is two carburetters and most importantly is the valve in head arrangement. Kevin Kirbitz says that a photographer was sent to the Flint plant for a photo op and I think someone may have seen more than they should have. Either way the similarity is apparent but just as with today’s engines, “one looks just like another”. Here is the original photo of the one shown below (that the Buick photographic department cleaned up) showing the push rod lifter bosses cast into the lower case when they were obviously not needed for this engine. It makes me think that Buick was planning ahead already for a valve in head engine that would make it’s appearance very soon. 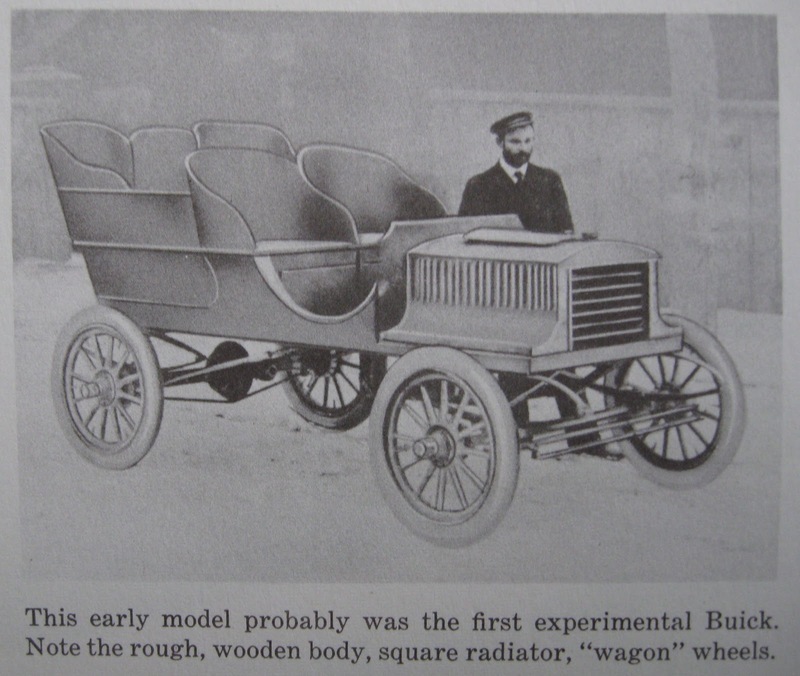 This photo is from David Buick’s Marvelous Motor Car by: Gustin and Kirbitz. This is the only known photo of this engine. This photo from the Buick’s First Half-Century (same as above only retouched) supposedly shows the first Buick engine made in Flint Michigan. 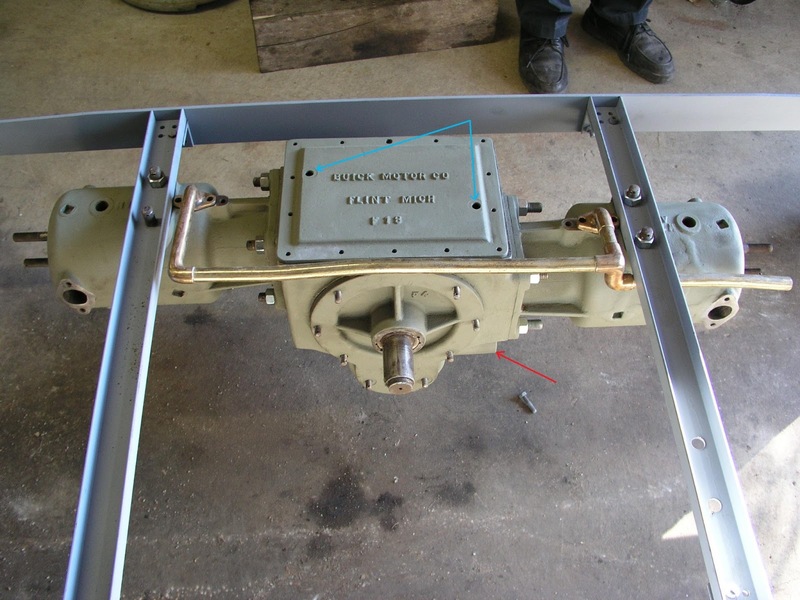 This is the L-head engine being built for sale to the Reid Manufacturing Company mentioned below and in the previous post. Here is a 1904 Buick engine for comparison to the Reid engine. 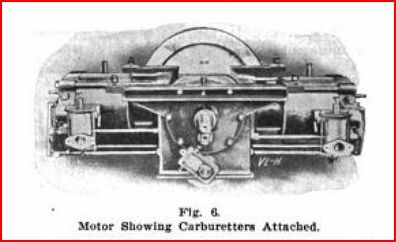 This 1904 Buick engine (same as above) shows the cast in boss for the push rods lifter (red arrow). 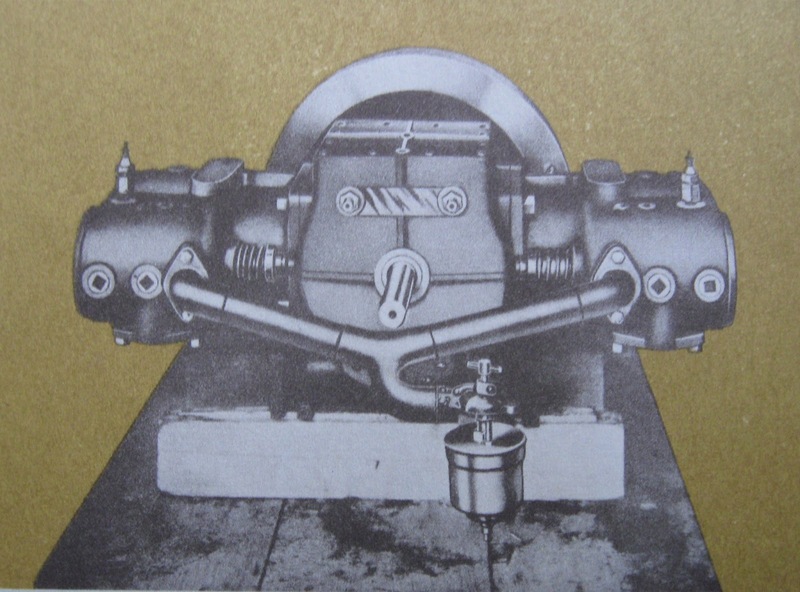 The L-head Buick engine that was sold to the Reid Manufacturing company shows the same boss in place only staggered onto the opposite side. The holes on the top case are the oil holes for a 1905 engine. This engine could very well be a hybrid of the 1904 engine which has these in the lower case. Here is the Hamilton Mills mentioned in the photo at the bottom. This is a good view of the new rail bridge crossing the river with the loaded cars for weight. The Copeman building in the background was an old Durant Dort factory but was now run by Dallas Dort only. Another bad flood struck in 1917 and again in 1947. I have photos of those also but they are not relevant to this story. 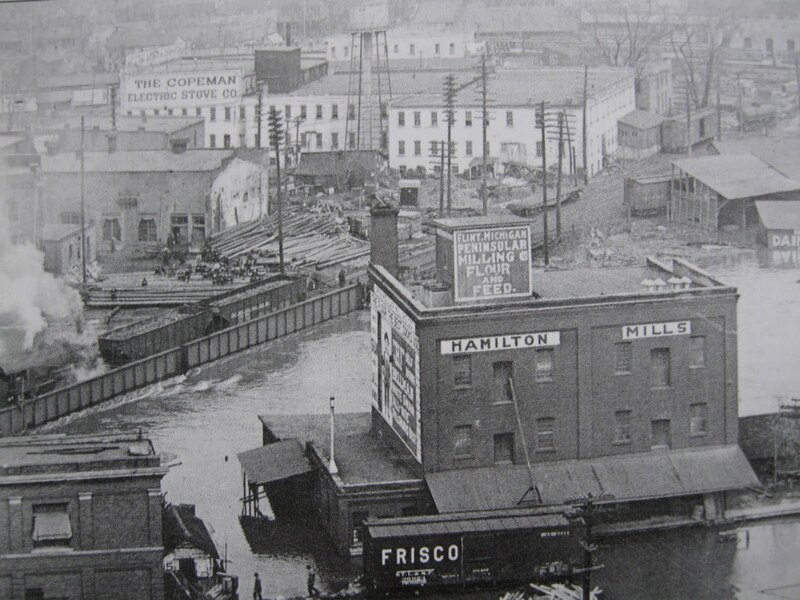 Click here for the complete Wolverine Citizen story about the 1904 flood. 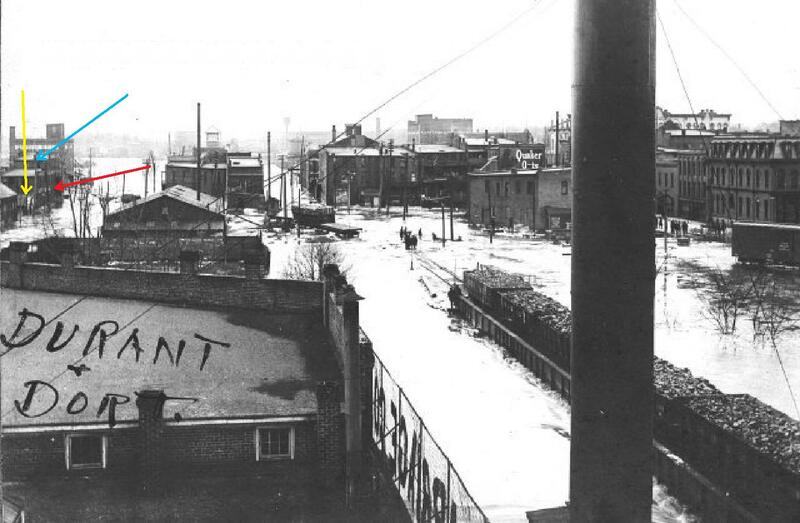 Here you can see were looking east up Water street with Durant Dort factory #1 on the right which is still in place in downtown Flint, or what is now referred to as “Carriage Town”. That is the bridge mentioned in the photo below. My mother lived on the corner of Water and Lyon directly across from this bridge. 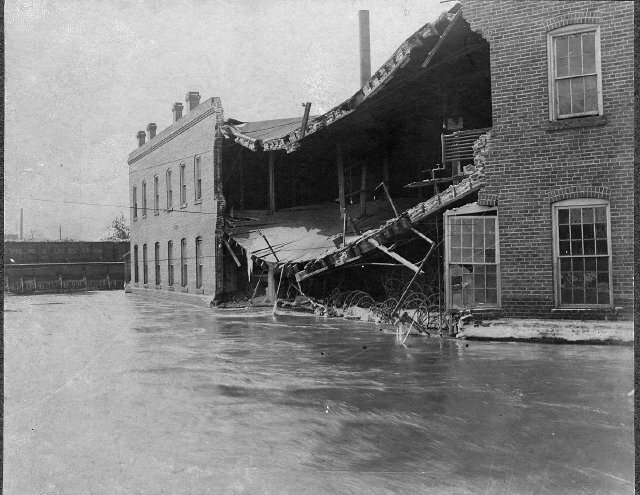 This is the collapse on the east wall of the Durant Dort factory #1 where the photographer was standing ‘on the roof” while taking the photo below. This was the blacksmiths area as denoted by the numerous smock stacks built directly into the wall. The Durant Dort #2 on Richfield rd. had the same feature and also the Flint Wagon Works on west Kearsley. As you can see they were also storing many wagon wheels here. This photo was taken from the Iron truss bridge on Water Street. This bridge was also known as the Durant Dort bridge and is the one I myself mention in the last post as crossing many times in my youth. The yellow arrow shows the roof structure of the Barker &amp; Hamel foundry during the 1904 flood (you can enlarge all these photos). The blue arrow shows the smoke stack. The red arrow shows the false front which was very common on buildings from this era. This photo was taken from the roof of the Durant Dort factory #1 facing east. As you can see the flood waters at this time are three streets south into down town Flint. That is the Crystal Hotel at the extreme right. Directly straight ahead in the distance is the tower of The Grand Trunk depot. 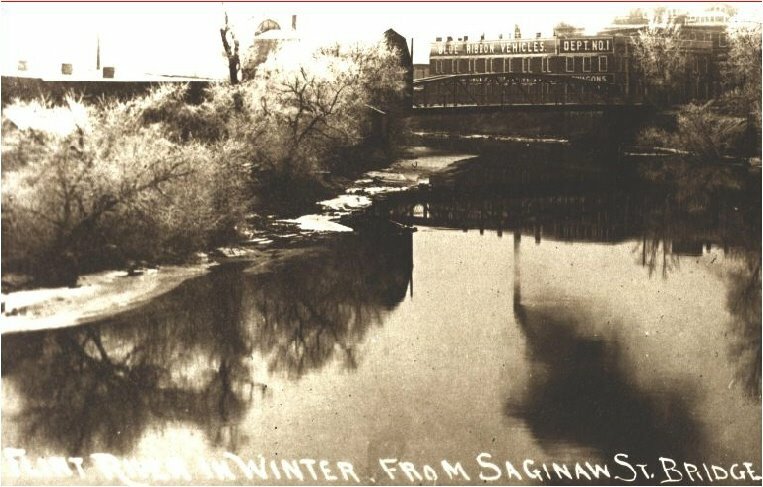 The tall structure in the distance at the left is The Hamilton Mills (shown above) on the south side of the river which is directly east of the new Pere Marquette iron truss bridge crossing the Flint river just east of Saginaw street. If you enlarge you can even see the area painted white on the false front where the name of the company would be. A small portion of that is visible on Jeff Harrisons photo of the workmen standing in front. Just click here for a large view. Very interesting! Thanks to my cousin Lee for sending this to me. My father worked at Buick from the age of 15 and died there on May 18, 1964 of a stroke or heart attack. He was a millwright.